The i4 Software is stored on an upgradeable flash card. We consistently release new repair procedures and features so you'll never have an obsolete i4. 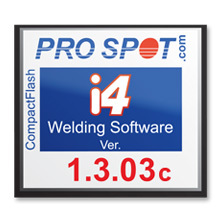 The Pro Spot i4 is available in an overhead ceiling-mounted version. The ceiling-mounted version hangs from the ceiling at 20' bracket spacing. 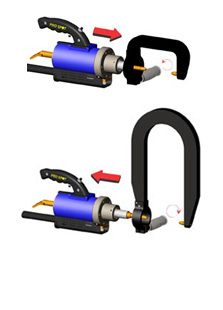 Push one button to open electrodes wide, then push the other button to close electrodes and weld. 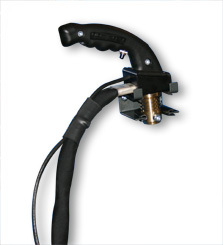 Pro Spot's PS-500 Spot Gun System features electrode pressure over 600 Lb. with all extension arm sizes. I-CAR minimum recommended squeeze pressure is 400lb. 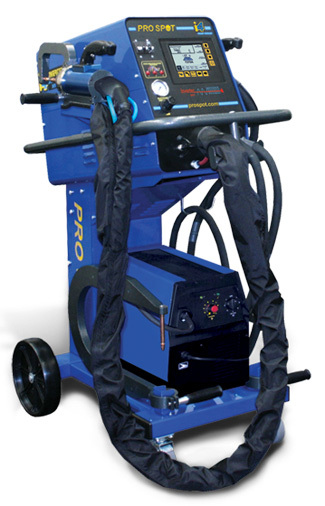 The i4 comes standard with several different types of weld arm extensions (508mm U-Arm, C-Arm, Wheelhouse Arm) and others are available at request, so that you can tackle any welding problem with as much ease and accuracy as possible. washer, nut & bolt, nail, rivet and stitch. 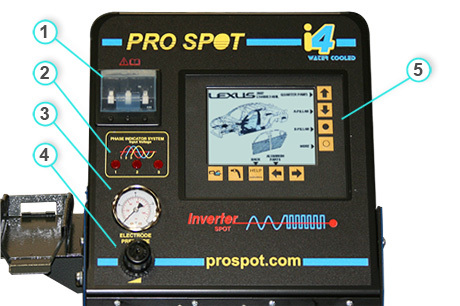 The i4 features a clean ergonomic interface layout with the power switch and electrode pressure knobs all set in a convenient and straight forward manner and a large 4x6" monitor capable of displaying images and OEM repair procedures. The i4's software is easily upgraded with a removable Flash Card as new data and information become available. 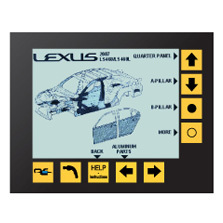 The latest i4 software features over 3,000 GM OEM repair screens in addition to Dodge, Toyota, Lexus, and Volvo. 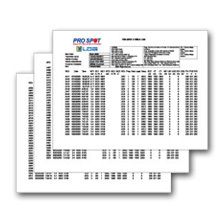 The i4 data log feature is an easy way to manage weld history, quality of welds, and power applied to each weld. Detailed information is stored in a log file that is easily accessed using a template stored on a removable USB flash drive. 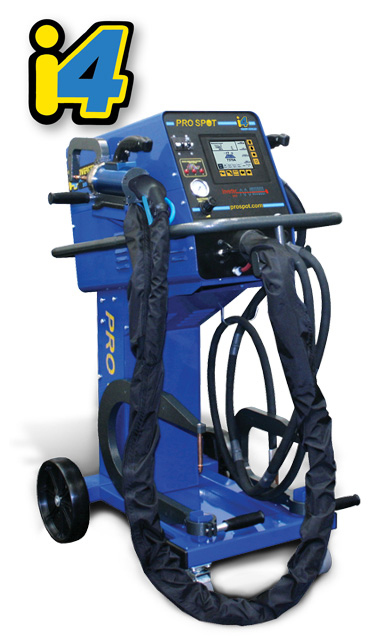 Weld-Bonding program for your advanced steel applications. Current is controlled via stored parameters. 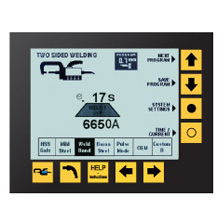 Amperage Feedback Display: Shows the exact amount of current being used by the welder for each weld. Access over 3,000 OEM Repair Screens (including: GM, Toyota, Lexus, Volvo, Dodge and More!) 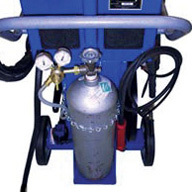 as well as general welder help and maintenance on-board. 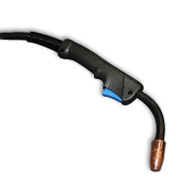 The i4 package can include a MIG welder as an option. It can also be installed later as an upgrade. 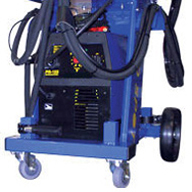 This feature allows the convenience of STRSW and MIG welding in one unit. The i4 has an overhead installation option. 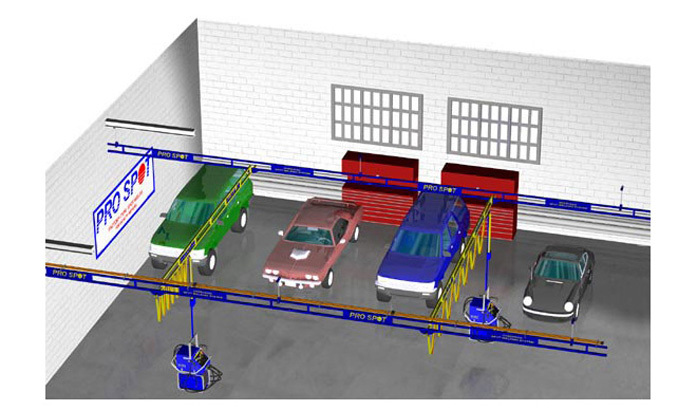 With the overhead option, the welder hangs from a track system that can cover up to 14 bays. No cables, air hoses or equipment on the floor. Always connected, ready to weld. Moves easily around the shop.